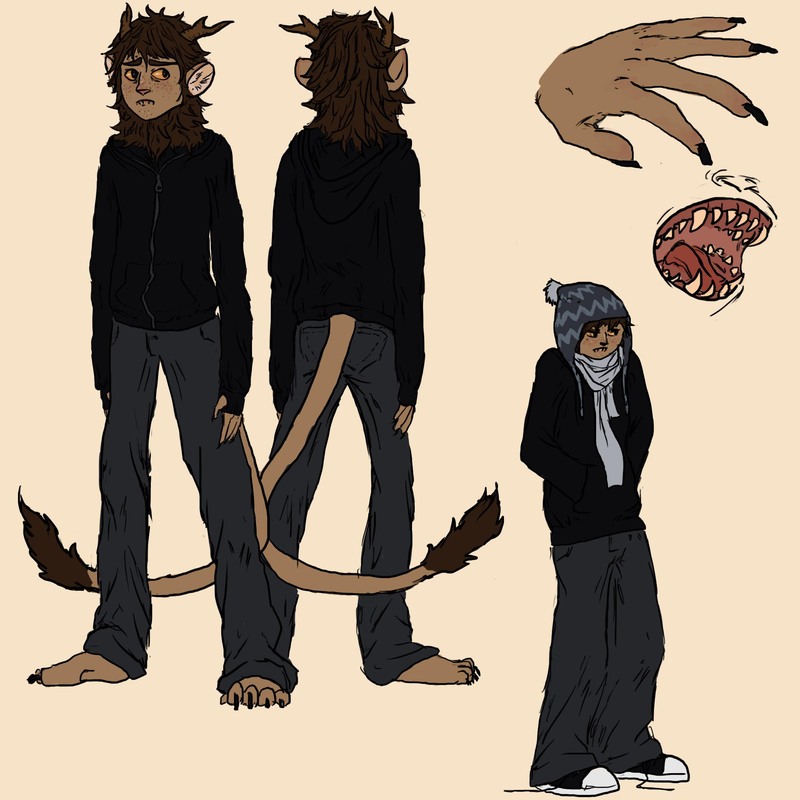 - Christopher has a wide variety of beanies/scarves/hoodies/sweaters to hide his more monsterous features. He by no means looks human even then, but it makes him stand out a little less. - His usual state is mildly grumpy. He tries to keep his true emotions hidden behind sulky indifference, but he often lets slip subtle gestures of kindness and affection. - He gets defensive very easily, especially at comments about his appearance. He is also very easily stressed. - He is rather uncoordinated, at least, when bipedal. He has fighting instincts, and is capable of being dangerous when seriously threatened, but he has little training or experience. His best weapon would be his shark-like teeth, seeing as his claws are clipped for safety and convenience (although they do still get caught on things). - His mother was killed for attacking humans. He was taken in and raised by a human woman as a cub. - Like deer, he sheds and regrows his antlers each year, but you don't have to worry about portraying this unless you really want to.